I love this picture of you! And the dress is perfect. That looks like Mike I. standing beside you. Third grade was fun for me, too. Like you said, we were ALL friends and played many games on the playground together. We had a giant sliding board that was very popular, especially in the winter time when we could “skate” off the end of it. And the thing we called the stride that we hung on and swung all around with feet flying behind us. Ah, the good ‘ole days! Beth, now that you say it I remember something called the stride. I don’t know if it was at this elementary school, or at the other ones that I went to. What I remember about this playground was that it was huge and totally uneven– some concrete, some blacktop, some pebbles, some grass, some dirt. We played different games on different surfaces according to some unwritten, but totally accepted, kid laws. I had cat woman glasses and long blond hair too. 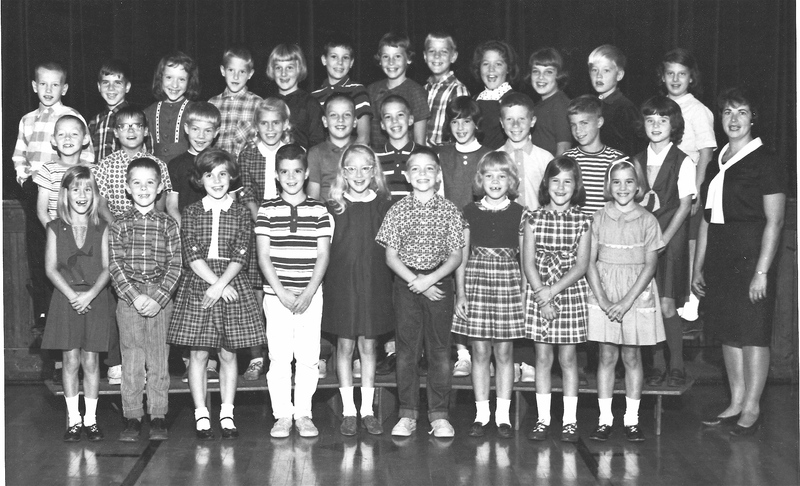 I always had to stand in front because I was one of the shortest in the class!! I loved Nancy Drew. Now the girl politics start up in 1st grade. (sometimes even earlier) Yucky stuff. Margaret, I’m sorry to hear about how much earlier the queen bee stuff starts. That’s a shame. In retrospect, fourth grade seems too early for that crap– let alone first grade. This is the best class picture. I absolutley love it. Thx Relyn. We were a cute bunch of goofs, weren’t we? Ah, that was a great year! My favorite book from the class bookshelf was “Ben Franklin, Printer’s Boy” — read it several times (can’t explain why and won’t try). Remember dressing the colorform Barbie and Ken paper dolls to coordinate with the weather? And, yes, I loved the stride. I also took great pleasure that a certain boy (who will remain nameless) never caught me and planted a kiss. For some reason, he liked to chase the girls and kiss them. Yes it was, Sherry. I don’t remember that book at all, but I do remember the weather paper dolls. And for the record, that nameless boy caught me by the big old oak tree and planted a kiss on me. It was the ultimate “yuck” moment of the year!